Percy's Predicament is a balance based platformer similar to Super Monkey Ball, but does it live up the the standards set by SEGA's semi-popular series or should it be avoided? Find out by reading the rest of the review! 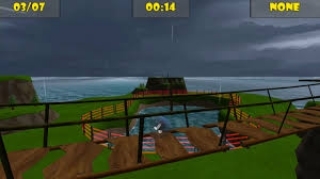 The gameplay in Percy's Predicament is a 3D platformer that will test your balance and eye hand coordination and plays similarly to Super Monkey Ball, but it's a good deal more difficult than Super Monkey Ball. The stages are brilliantly designed and are riddled with many traps and obstacles that will test your skills. The game's 80+ courses start off easy, but quickly get difficult and you are given very limited time to finish each level which can become extremely stressful. 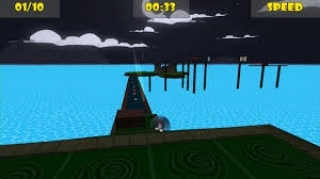 The object of the game is to collect all of the fish in each level and reach the teleportation device located in the level to beat each stage! The only serious issue with this game is the camera control which makes it almost impossible to cross the narrow bridges due to the lack of a camera centering feature and is the cause of a great deal of stress which is a big problem that hopefully will be addressed in a future update to the game. The rest of the controls are quite responsive and are easy to learn, but it doesn't make up for the terrible camera control. The graphics in Percy's Predicament are decent enough with decent 3D models, good draw distance, and the lack of jaggies. On the downside the levels recycle alot of the object models of earlier ones making the later levels feel a little less inspiring, but overall it is just a minor complaint. The sound effects are quite simple, but work really well with the game and the music is subtle yet very fitting for the game so overall the presentation of the game is fairly solid. 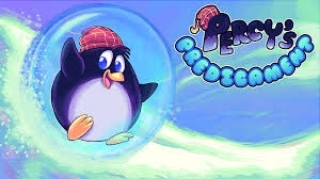 With good gameplay and brilliant level designs Percy's Predicament has potential to be a great game and it's graphics and music a fairy good as well, however the terrible camera control in this game makes Percy's Predicament too stressful to properly enjoy so until these issues are properly addressed the game is not as highly recommended as it would be. Still if you can get past the issues Percy's Predicament can be an enjoyable experience! The camera is very bad so I quit mid game. I seriously had no knowledge of this game, until it was released the other day. I just noticed a few typos. ^ I laughed so hard when I read that typo! Kushina wrote: I just noticed a few typos. It is still there lol. Brilliant review otherwise though!